Online Bookstore: New Book Arrives! Susan discusses the amazing opportunities that VoIP (Voice over Internet Protocol) platforms offer for effective volunteer management. You may already use Skype to interview prospective volunteers or to interact with remote volunteers. What about as a method of bringing expertise and training to your organization? Read this month's Hot Topic. Still time to register - but act now! Virtually join Susan "Down Under" in this one-hour webinar on thorny issues of performance management in volunteer engagement. Negotiating Relationships with and among Volunteers (click for more content details) is presented by Pro Bono Australia and the 2016 Australian National Volunteering Conference. It will occur live in Australia on Wednesday, March 9th, at 11:00 a.m. AEDT (Sydney time zone). Check the World Clock for the conversion to your time zone. In North America, this means Tuesday, March 8th between 4:00 and 7:00 P.M.
Can't make the date? All registered participants will be sent a post webinar pack 2-3 days after the session. The packs include the live webinar recording, slide deck and webinar book. The webinar book is a tool designed to ensure your learnings last. It includes the session's transcript with corresponding slides, the live chat stream (so you're across peer discussion) and presenter notes. Whether you are wanting to brush up on what you've learned or if you missed the live session, the post webinar tool kit ensures you're always across the session's learnings. The price for the webinar and the pack is AU$55, which is approx. US$39. Register now! Volume XVI, Issue 2 of e-Volunteerism, our international, subscription-based journal, activated several new articles since the last Update. As always, all previous journal issues are available to subscribers online in the Archives. Beyond the Mundane: Using Nametags to Build Community in Volunteer Programs(Volume IV, Issue 4, July 2004) - Scott Ginsberg explains how nametags are your best friends- especially in volunteer situations where new people constantly come and go. They provide outlets for communication not unlike front porches, in that they make people less uncertain and more approachable. Could A Robot Do the Job of A Volunteer Manager? - The BBC ran a series of news stories on the development of robotics, following up a study by researchers that predicted about 35 percent of current jobs in the UK are at high risk of computerization over the next 20 years. As a bit of fun the BBC asked, "Will a robot take your job?" and provided an online tool to help people answer this question. Rob Jackson and Susan J. Ellis offer some opinions on whether leaders of volunteers should fear a robot takeover. Developing Effective Volunteer-Employee Relationships - Laurie Mook reviews a study out of Tel Aviv University, comparing the perspectives of Israeli social workers who worked with volunteers in municipal social service agencies to those who did not work with volunteers. The goal was to increase our understanding of an effective volunteer-employee relationship. More great content is set for release this month: an article on how the Imperial War Museum North in Manchester, England has spent more than a decade on nontraditional volunteer engagement; Web resources on volunteering with and for refugees; and a history of activism in Belfast, Northern Ireland. 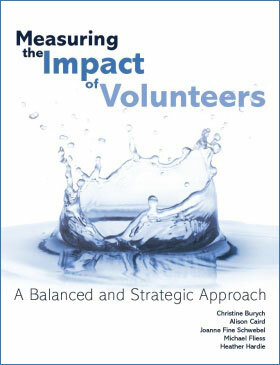 One of the things I value in our newest publication, Measuring the Impact of Volunteers: A Balanced and Strategic Approach, is its insistence that the work volunteers do must be aligned with the mission of the organization. The authors make a strong case for demonstrating the impact of volunteer involvement by proving that all those donated hours and talents are focused on the current priorities of the organization and the people it serves. Think of the organization as a ship. The vision is your intended destination, and steering the ship safely there is your mission. To do that, you get your daily orders from the strategic plan. And when we talk about alignment, we are really talking about ensuring that the daily orders support the running of the ship to get to its destination. Alignment means that all decisions and activities will reinforce and strengthen our ability to achieve the end goal. In chapter 2, they show how the leader of volunteers can put the idea of alignment into practice (the following is excerpted from the book, pp. 8-9). Begin by intentionally familiarizing yourself with the organization's mission statement and written strategic plan, and understanding what the short- and long-term goals and objectives are for each program or service. This will ensure that volunteers are integrated with those efforts, not working at cross-purposes - part of the solution, not the problem. Once you understand the priorities and goals of the rest of the organization, you can assess if volunteers are truly doing the most important things. You can apply a SWOT (strengths, weaknesses, opportunities, and threats) analysis of volunteer engagement to the directives of the organization. Strength: Where is volunteer engagement already aligned with and supporting an organizational goal? Weakness: Where is volunteer engagement not aligned, redundant, or even working at cross-purposes with organizational goals? Opportunity: Are there any emerging possibilities where a volunteer role could be introduced? Threat: Are there any emerging changes or shifts that will have a negative impact on the effectiveness of a particular volunteer role? From your answers, you should be able to identify the volunteer positions and projects that you would like to improve, replicate, discontinue, develop, create, or redirect. You also need to identify current gaps in programming/service. Often the best ideas for improvement come from the end-users of a product or service. For volunteer engagement, this includes staff, clients, families of clients, and other stakeholders. Of course, active volunteers will play an important role in contributing to the process, as they will often see gaps and needs that are not being met. Take time to talk with stakeholders to see what concerns them the most about their experience with your organization or if some service is missing. From this input, identify ways the right volunteer or volunteer initiatives might help. From this beginning, the authors explain how to create a "Volunteer Resources Balanced Scorecard" as a strategic planning tool, and later as an evaluation tool. Most important, of course, if volunteer accomplishments are directly aligned with what everyone else in the organization is working towards, it becomes easy to report to all stakeholders how critical volunteers are to total success. See more about Measuring the Impact of Volunteers: A Balanced and Strategic Approach by Christine Burych, Alison Caird, Joanne Fine Schwebel, Michael Fliess, and Heather Hardie, � 2016, Energize, Inc. in the column to the left.